As the presidential election approaches, the Santa Rosa paper is relentlessly attacking the Republican candidate. Readers are told he lies about his past to impress voters and he won’t listen to others because he foolishly believes he’s always right. His own party wants nothing to do with him. His proposals are simplistic as well as unworkable and unconstitutional (a document he’s obviously never read) and he will destroy the country if he gets within a mile of the White House. Plus, he looks funny. The newspaper is the Sonoma Democrat. The Republican is Abraham Lincoln. The year is 1860. 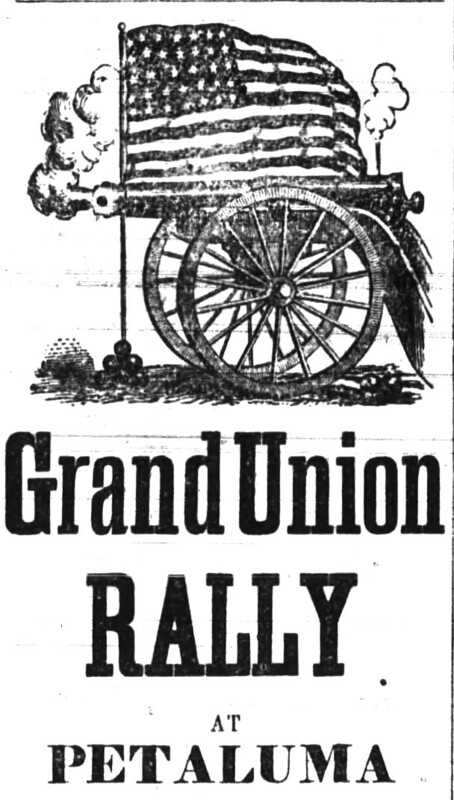 The Sonoma Democrat was the direct ancestor of the Press Democrat and before, during and after the Civil War was relentlessly pro-Confederate. 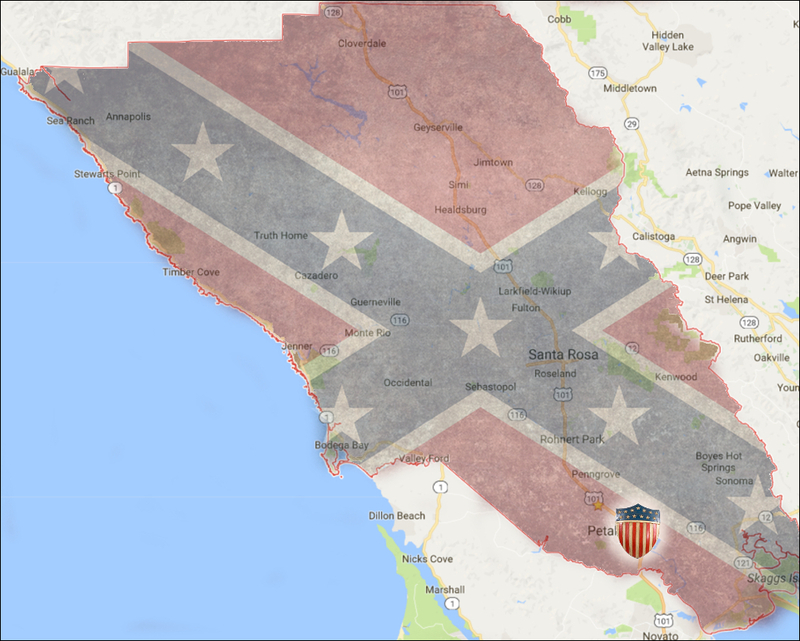 Most of Sonoma County shared those sentiments to some degree – this was the only place in the state which did not vote for Lincoln either time. But editor Thomas L. Thompson shaped the Santa Rosa newspaper into the sort of rag that might have been published in the Deep South at that time, not only pro-slavery but astonishingly racist. Now that the Democrat is online we can search it and find there were at least 330 uses of the “n-word” between 1857 and 1886. To squeeze that many hateful slurs into a four-page weekly reveals Thompson to be an awful person and probably a little crazy. There’s no question he was certifiably nuts when he committed suicide in 1898; the coroner’s jury ruled he was “mentally deranged” after ranting that the Odd Fellows’ Lodge was out to get him. In the run-up to the election, sample items from the paper transcribed below show Thompson fed his readers a steady diet of anti-Lincoln, anti-abolitionist bile. To make sense of some of these articles it’s important to know this was an odd four-way election with both Northern and Southern Democrats in the running. Besides Lincoln, the official Democratic Party candidate was Stephen A. Douglas, who thought he could somehow forge a grand compromise to keep the United States patched together; Southern Democrat Breckinridge, who wanted to uphold slavery as an absolute Constitutional right; and third-party candidate Bell, who wanted to appease the South by ignoring the slavery issue altogether. The Sonoma Democrat introduced readers to Lincoln that summer with ad hominem attacks. Lincoln had “neither firmness in his countenance nor fire in his eye” and lied about being a rail-splitter in his youth, as people in that part of Illinois made their fences from pieces of wood picked up in swamps (having grown up near there, I can attest there are no prairie swamps). During his service in the Black Hawk war, the paper claimed he forgot to untether his horse and fell with the animal when he tried to ride away; believing his horse had been brought down by an ambush, “Old Abe” tried to surrender to the non-existant Indians. Sonoma county readers were told that some delegates at the Republican convention were “mad as March hares, and swear they would as soon go for Jeff. Davis, Douglas or any other minion of slavery, as for this third rate, rail-spliting Lincoln.” Items reprinted from like-minded journals insisted he was a dead weight on the ballot and could not possibly win – although his inevitable loss in New York state would cause chaos, as the outcome would then be decided by the House of Representatives (he won New York by nearly eight points). But more than anything else, Thompson kept hammering that Lincoln was a “Black Republican.” In Thompson’s argot, this was the worst thing he could call someone because it meant they believed African-Americans were human beings with legal rights. Whatever lip service Thompson and his ilk gave to state’s rights and the constitutionality of slave-holding, its rotten core was always racist hatred. On election day Lincoln got 1,236 votes in Sonoma county, behind Breckinridge’s 1,466. 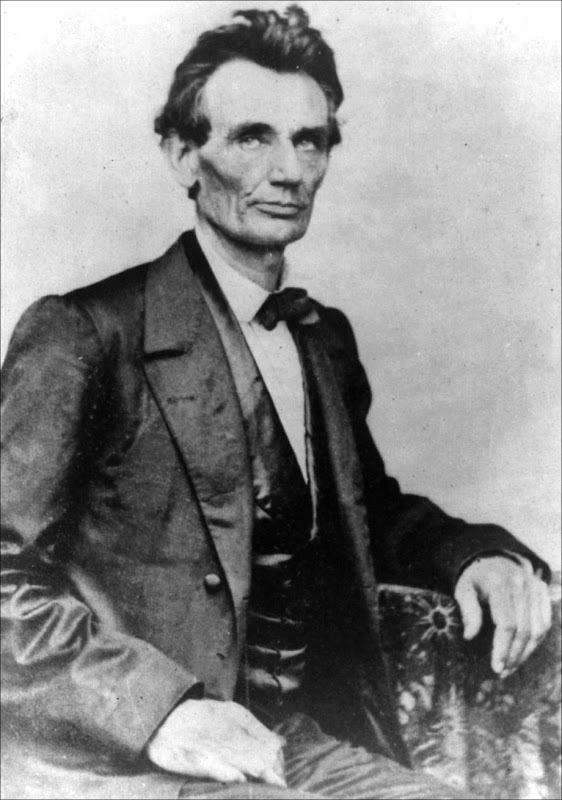 Petaluma was the only town Lincoln won, with 375 voting for him. Santa Rosa cast 91 ballots for Lincoln and 205 for Breckinridge. Thompson hunkered down in the final weeks of 1860, bitterly spinning a story of gloom and doom. Stock markets were in a “panic” and banks in two southern states were expecting to be closed. The “free negroes, their aiders and abettors” were plotting to avenge John Brown’s death with help from the Republicans. There was a recurrent theme in the dispatches from the pro-southern papers that the South was keeping a steady keel while the North was falling apart. Charleston supposedly would not allow steerage passengers on steamboats coming from the North to disembark unless there was a guarantee they would not become vagrants. DOUGLAS AND LINCOLN. — The men are entirely dissimilar. Douglas is a thick set, finely built man, with an air of self confidence. Lincoln is a tall (six feet four), lank man, awkward, apparently diffident, and when not speaking has neither firmness in his countenance nor fire in his eye. News from the Atlantic states. The Pittsburg Post says: An old citizen who traveled in Illinois thirty years ago, and was especially familiar with the district of country where Abe Lincoln resided, says that Abe never split a rail in his life. In those days, he says, the people never thought of such a thing as splitting rails. They went into the swamps and cut hoop-poles and saplings for fences, and used them, round, as nature made them. The conservative and Union loving men of the North are making every effort to defeat Lincoln. All parties concede that should Lincoln lose New York his defeat inevitable. 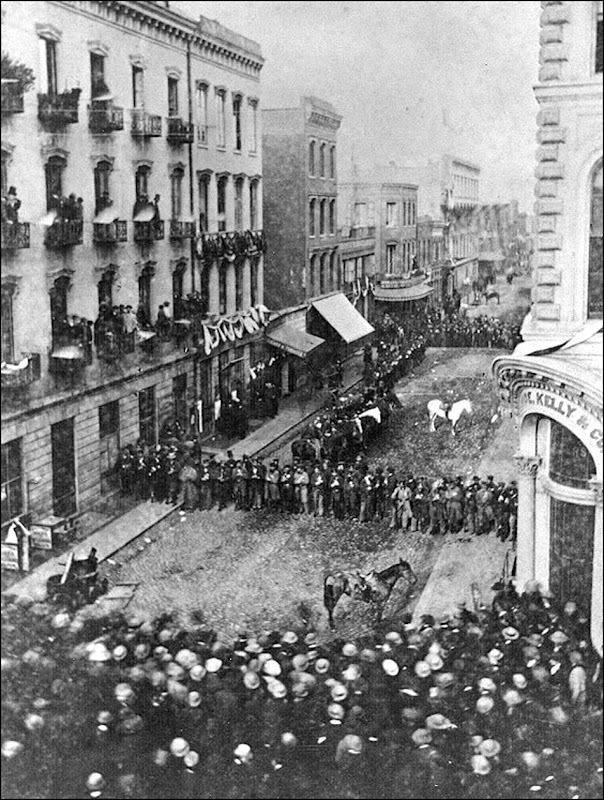 By reference to our Eastern news today, it will be seen that there has been a complete fusion between all the elements of opposition to the Black Republicans in New York-—the vote of that State to be cast for Douglas, Breckinridge or Bell, as they shall receive the highest popular vote. This will undoubtedly throw the election into the House of Representatives, and secures beyond question the defeat of Lincoln. …On one side stands Lincoln, proclaiming the social, moral and political superiority of the North over the South, and calling upon men to enter into an “irrepressibly conflict” for the complete and entire destruction of the Southern States. On the other hand we have Breckinridge proclaiming the equality of the States, the harmony of commerce and industry, the sacred and constitutional right of self-government.–N.Y. Herald. REPUBLICAN MEETING.– Hand-bills have been staring us in the face upon every corner for the last week, announcing that James Churchman, Esquire, of Nevada, would address the irrepressibles of this place yesterday. Well, the eventful evening arrived and so repaired to the Court House expecting to hear the Democracy entirely demolished. We found assembled exactly seven Republicans, most of whom were from abroad; there may have been as many as twelve, since there were three or four persons there whom we did not know. There were besides these some fifteen or twenty snuff-colored gentlemen, and about seventy-five Breckinridge and Bell men. The irrepressible gentleman had already commenced when we arrived, so that we did not hear the first part of his harangue. We listened to him, however, about three quarters of an hour, and we must say, we heard the most pithless, pointless batch of misrepresentations we have ever listened to. Mr, Churchman’s address is pleasing, and his manner well calculated to attract tho attention of a promiscuous assemblage; but he did not make a single point during the time we listened to him, that deserves the space it would take to refute it. KEEP IT BEFORE THE PEOPLE, that Abraham Lincoln opposed the war with Mexico and declared it unnecessary and unjust. Keep it before the people, that the Republicans are in favor of placing negroes on an equality with the whites, and in many of the free States sanction amalgamation. Keep it before the people, that in Massachusetts the Republicans proscribed foreign-born citizens and attempted to deprive them of the right of suffrage, and would have succeeded had the Democrats not opposed it. Keep it before the people, that in the same State negroes were elected delegates to conventions and assisted in nominating Republican candidates for Congress. San Francisco, Nov. 13th, 1860. Editors Sonoma County Democrat: The great battle is over, and although it has resulted in partial defeat, let not Democrats be disheartened, but rather let them organize and prepare themselves better for the next struggle, when the now prevailing party will have been “played out,” as were their immediate successors. Although six days have passed since the election, little is yet known of the result. According to latest accounts Lincoln is about 1100 ahead, but this seems doubtful, as it is strongly suspected that the despatches are not much to be relied on, having been gotten up more for betting purposes than for the diffusion of reliable statistical information. The news from the East will be sent with the greatest despatch by the Pony, and will be received here the fore part of next week. The telegraphing facilities of the Eastern States will be tested to their utmost, but it is generally expected that the general result will be known by that time. How annoying it is that the knowledge of a great event must be kept from us for days when a few hundred miles of telegraphic wire would put us in immediate possession of the all-desired information. The news by the Pony confirms the unwelcome intelligence of Lincoln’s election as the next President of the United States. At the same time it brings the news of movements in several of the Southern States, which indicate a fixed determination on their part to remain no longer in the Union. Their perfect and sovereign right to secede, if they desire to do so, must be conceded from the very nature and formation of our government. There are but two means by which any Union of States can be maintained or preserved; one is a community of interests, the other a preponderance of force. The former is the only means which was ever contemplated, in the formation of our Constitution, for the very objects of its formation, viz: “To establish justice, insure domestic tranquility, provide for the common defence, promote the general welfare, and secure the blessings of liberty,” utterly preclude the idea of using force for its preservation, for this use of force would at once defeat every object for which the Union was formed. If these States, therefore, in their sovereign capacity, see proper to secede from the Union, there is no power under the Constitution to prevent them; and any attempt to coerce them would be as unconstitutional as it would be unholy, unjust and futile. This movement may be one pregnant with mighty consequences. There has never been a period in the history of our government when there was so much necessity for wise, deliberate and cautious procedure, and it is well that the people should weigh and consider the causes which have led to these untoward results, and prepare to meet the mighty events which loom up so portentiously in the future, for, as has been well said, it is for them to decide what course they will sustain the administration in pursuing toward those states which may secede. The excitement in the South continues, accompanied with general depression in the markets and trade, amounting to a panic. There has been a general decline in stocks at New York, and a great increase in rates of exchange at Chicago. There is a tightness at St. Louis, and perfect derangement in monetary affairs South. The South Carolina and Georgia Legislatures have prepared for a suspension of their banks. No suspensions have yet taken place. The Mayor of Charleston has notified the agents of Northern steamers that he would not permit the landing of steerage passengers, unless the companies guaranteed their maintenance, if they became vagrants. Merchants have now goods on hand, but no new orders will be given to the North, except such as are indispensable. Is it strange that the South should bo excited und alarmed in the face of such proceedings, sanctioned and encouraged by the Black Republicans of the free States? Does not prudence dictate that they should be prepared to meet and repel a second John Brown raid? Do not the free negroes, their aiders and abettors, contemplate a second foray into the Southern States? Do the negroes not hope to avenge the death of John Brown, and have they not reason to anticipate assistance and protection from the Republicans? WHO ARE THE DISUNIONISTS?– The New York Herald, of the 10th ult., says: We publish below an account of the Northern Slates which prohibit their officials and citizens from aiding in the execution of the Federal Fugitive Slave Law, and which by their action, have boldly nullified the Constitution of the United States…It will be seen from the above that the Northern States are nearly all in a position of practical disunion–that is, they have refused to sustain the constitution which their fathers adopted.